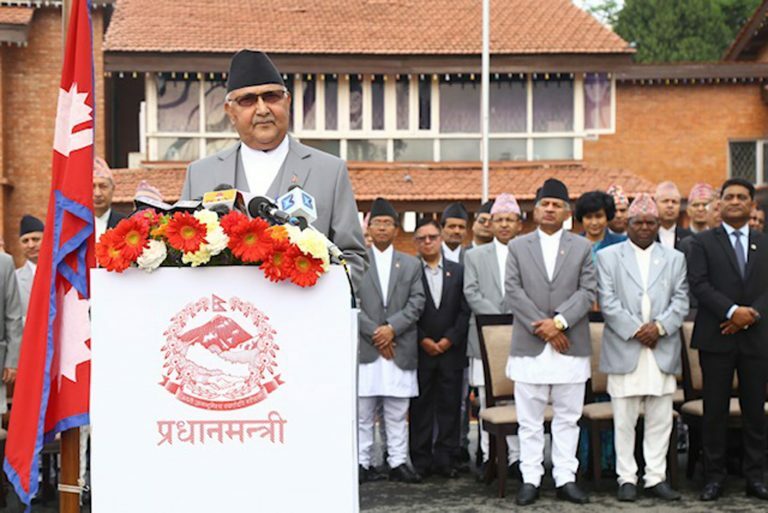 KATHMANDU, April 14: Prime Minister KP Sharma Oli has said that he was committed to the goals for peace, unity, and development as aspired by the Nepali people. In his address to the nation from his official residence at Baluwatar today morning on the occasion of the New Year 2076, he resolved to continuously fight against corruption and anomalies, terming these as the hindrances to good-governance and prosperity. Stating that prosperity was the basis for happiness and that higher and sustainable production growth was the only goal of the present government, the Prime Minister said what he aspired for was prosperity with social justice. He vowed that the country would be soon freed from all types of extremism, violence, terrorism and disturbances, reiterating another vicious cycle of violence would not at all be acceptable to the country which has ‘recently started moving on the path of stability by putting to an end a drawn-out conflict and transition. Calling on all Nepalis to be cognizant of the time while we are welcoming the new year and bidding farewell to the old one, PM Oli maintained that the government under his leadership was working with the goal of lifting up the country from the ‘pathetic status’ of an underdeveloped country to a higher status within its this very term and the goal of meeting the sustainable development goals set for 2030. He stressed that the incumbent government was working seriously to maintain good governance, recalling that he had launched a campaign against irregularities and corruption last year to that connection. “This year also, I am determined to carry out works by keeping good governance on top priority,” he asserted. The School Enrollment Campaign had been launched from Rara of Karnali on New Year’s Day last year, he recalled adding, “Many questions such as–how could good schools be established for educating our children? how could good roads be constructed? how could adequate human and physical resources be developed?, how could electricity be generated from the Karnali River and other rivers of the country to illuminate the villages and remote settlements? how could the barren land be cultivated by developing irrigation and how could the foundation of the federal setup that was only recently established be made stronger?– were in his mind while announcing that campaign. PM Oli noted: “We have been able to change the negative thinking that the country cannot be built and works do not move ahead to the confidence that ‘works can be carried out and Nepal can be made prosperous within our lifetime'”. In this connection, he referred to: ‘A World Ready to Learn’, a report published recently by the United Nations Children’s Fund (UNICEF) which states that student enrollment in the pre-primary education in Nepal was 86 percent which is ahead in the world; to international financial institutions’ officials participating in the Nepal Investment Summit 2019 held recently terming Nepal as ‘rising star’ of rising economy in South Asia; to the various countries of the world taking Nepal’s peace process and its participatory government system based on competition as inspiring and exemplary; and to the formation of a stable and strong government through a mixed election system as a rational decision of Nepalis and their deep hunger for development. “I have been reiterating that federalism is completely a new practice for us. There are challenges in its operation. However, the governments at all levels of this system are at present are in a phase of learning by trial and have been moving ahead learning from practice and shortcomings. Our federal democratic republic is rising up from its foundation. This twig which has sprouted in our own land is growing. I want to extend my best wishes and congratulate all those who were involved in this process of the country’s economic and political transformation and who supported in institutionalizing and making it functional,” the PM stated.